Postcard view looking northwest from the Key West Lighthouse, ca. 1870. Looking northwest from the Key West Lighthouse, now a museum operated by the Key West Art and Historical Society, the Ernest Hemingway Home and Museum is visible. 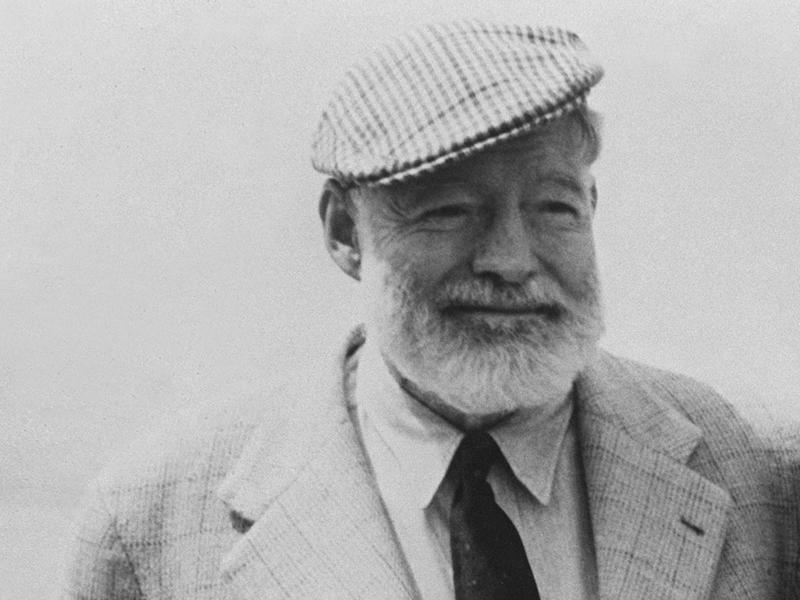 Pictured here in the bottom right, the museum is famous for its six-toed “Hemingway” cats. The house was originally built by Asa Tift, one of the island’s first shipwreck-salvaging magnates. 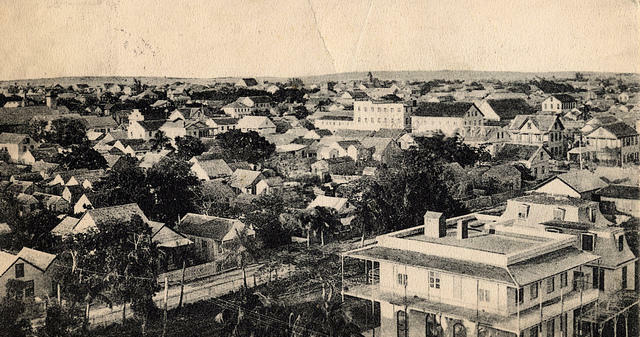 After the fire of 1886, structures were required to have metal roofs, which some historical Key West buildings still do. 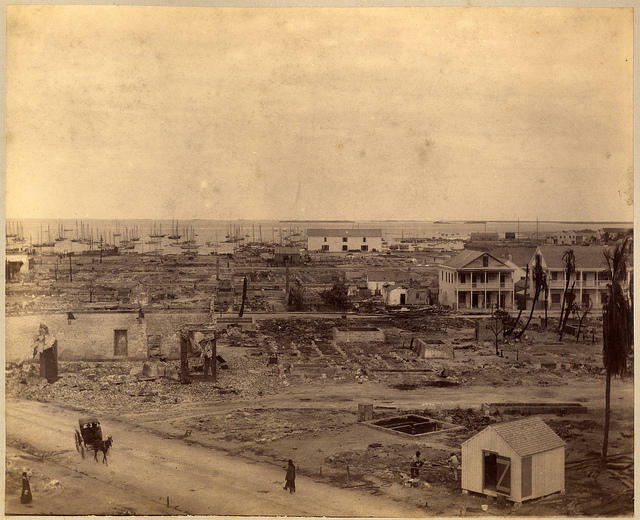 On April 1, 1886, a fire destroyed much of Key West’s downtown commercial district. 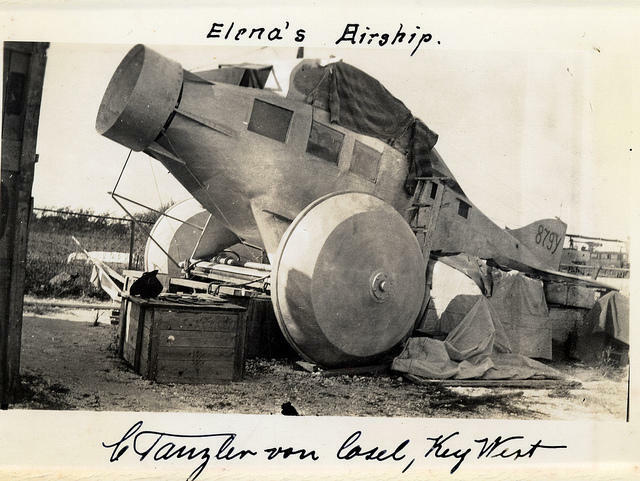 It burned for more than 12 hours – not helped by the fact that the island’s only steam fire engine was in New York for repairs. Damage was estimated at more than $2 million, only about $50,000 of that covered by insurance. Most structures in the historic district today still have metal roofs, a requirement that began after the fire. 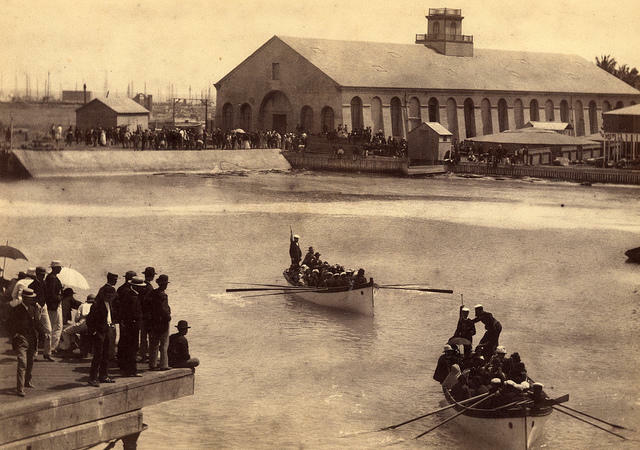 This photo shows Cuban workers leaving Key West by Spanish ships after the fire of April 1886. Key West in the 1880s was a center of the booming cigar manufacturing industry. The tobacco was grown in Cuba, but the cigar-rolling factories were in Key West, both to escape Cuba’s political turmoil and to avoid import tariffs on the finished cigars. The island’s Cuban population swelled and Cuban-Americans were elected to public positions including mayor, justice of the peace, school superintendent and state legislator. Key West is closer to Havana than it is to Miami and frequent traffic between the two islands continued until the early 1960s. U.S.S. Maine soldiers being buried in Key West Cemetery, shown in stereoview, which produced a 3-D effect. 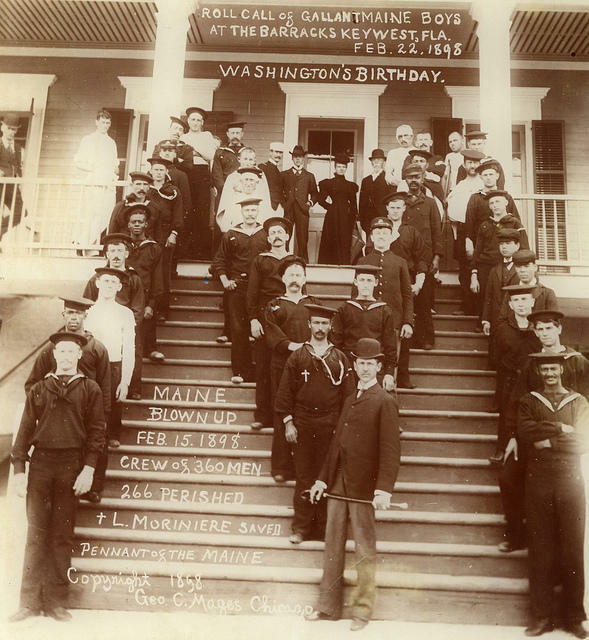 Some of the Maine survivors at the Army Barracks Hospital in Key West, by George C. Mages. The U.S.S. Maine embarked from Key West to Havana before it exploded in Havana Harbor, which helped trigger the Spanish-American War. This stereoview shows casualties from that explosion being buried at the Key West Cemetery, which still has the plot dedicated to the Maine sailors. Stereoscope and stereoview photographs were popular in the latter half of the 19th century. These photos, viewed through a stereoscope viewer – which looked like a pair of glasses mounted on a holder for the photograph card – gave the illusion of 3-D.
Tanzler had fallen in love with Elena Hoyos, a young tuberculosis patient. When she died, he stole her body from the cemetery and installed it in the contraption, where he essentially turned her into a wax mummy. Tanzler played organ music to his beloved and insisted that she awake and speak to him. When he was discovered, Hoyos’ body was put on display at the local funeral home and almost 7,000 people showed up for the viewing. This stereoview shows the island’s sponge market. Until synthetic sponges were developed, collecting and cleaning sponges from the nearby waters was a major industry for the island. It continues today on a much smaller scale. The rivalry between Key West spongers and Greek spongers from Tarpon Springs fueled the plot of the 1953 movie “Beneath the 12-Mile Reef,” starring Robert Wagner and Peter Graves. A man shows off his goliath grouper, a species that is now protected. Turtling was another major, sea-based industry for the island. This stereoview shows green turtles being prepared to ship to New York. Sea-turtle harvest continued until the 1970s, when they were protected. The most historically significant item in the collection donated to the library isn’t a photograph. 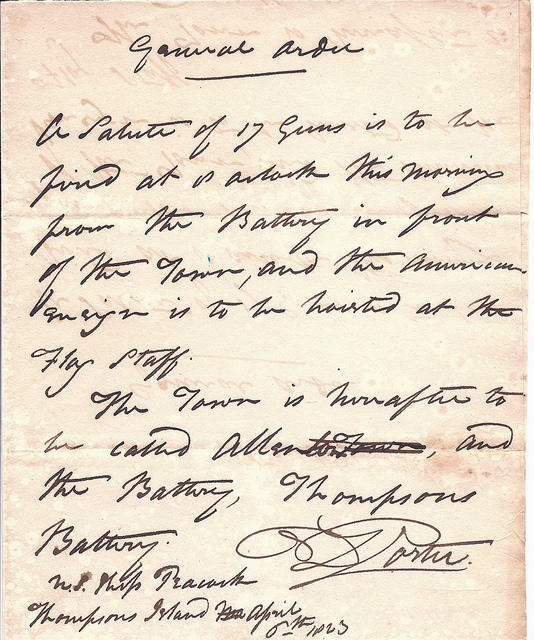 It’s a letter from 1823, with orders from Commodore David Porter for the Navy to take possession of the island and rename it. But “Thompson’s Island,” after the Secretary of the Navy, didn’t take. Five years later, the town incorporated as Key West, an Anglicization of the island’s longtime Spanish name, Cayo Hueso. More images from the recent donation can be seen at the Monroe County Public Library’s Flickr site. Key West’s 18th Annual Lobsterfest wasn't just about stuffing your face with lobster tail. Lobster newcomers and lobster veterans paraded down Duval Street at the lobster street fair, some wearing lobster hats collected over years. Among the 200 booths, there were several lobster gear vendors. Don Burge owns Mullet Wear Outfitters, which he describes as “a spoof and a goof on all the big fishing outfits.” He sells his wears at seafood festivals throughout Florida. Combine two hot-weather refreshments, beer and ice cream, and you get a beer milkshake. Depending on your perspective, this beverage may sound either intriguing or alarming, but two restaurants in the Keys pull of the mash-up successfully.